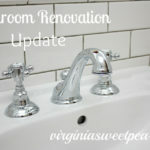 If you missed Part One, we are renovating our upstairs guest bathroom. 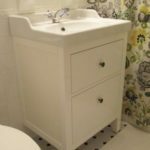 Last week our floor tile was delivered from Home Depot, we ordered a vanity and sink, and we purchased the wall tile from Lowes. Some of the supplies are upstairs near the bathroom and others are still on the porch. The tile boxes are pretty heavy! Mr. SP worked hard on Saturday to sand the ceiling and then to coat it and the walls with Kilz. You can’t tell from the photograph, but the ceiling is now nice and smooth and you can’t tell that the paint just a few weeks ago was chipping and peeling everywhere. A new vent fan that hasn’t been purchased or installed should solve this problem in the future. The final paint color will be determined after I pick out fabric for the shower curtain and window treatment. 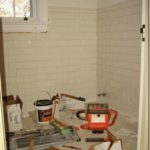 On Sunday Mr. SP started to install the subway tile. He didn’t get too far but did get a good start. Tomorrow a plumber will come to install a new faucet in the shower. 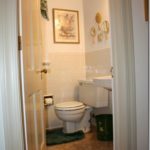 The old faucets are original to the house and leak, even after repeated attempts at fixing them. While he’s here, he’ll also install a new faucet in our main bath which is also original and leaks. It’s exciting to make some progress on this project! I’m hoping that Mr. SP will tile away this weekend! Paula, it’s going to be such fun to see this bathroom when it’s all finished! I know you must be thrilled with the progress. Don’t you just love subway tile? Mr. SP does good work! Exciting stuff Paula, can’t wait to see which fabric you choose. The subway tile looks really good. I’m currently stripping wallpaper in our master bathroom. Not fun. Hi Paula! Oh, I love the subway tile and how exciting! Can’t wait to see the complete reveal! I really like the subway tile! I love clean and simple. Can’t wait to see the final product. Can’t believe your doing this yourselves! How exciting. Just let me say from experience 🙁 sanding down a ceiling is NOT fun. I’ll never do it again. It’s going to be beautiful. 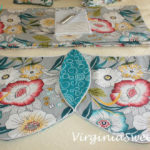 I have to say, I love all the fabrics! And I’m excited to hear about the fabric in real life, that last floral is beautiful. This is going to be GORGEOUS! Can’t wait to see the final pics. 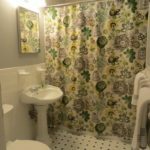 We used subway tile in our basement bath, and it’s my favorite. Have you looked into vent with built-in heaters? Not much more expensive, but soooo nice. We put one in my oldest daughter’s bathroom, and she says it’s heavenly. Happy Friday! I can’t wait to see it all finished! 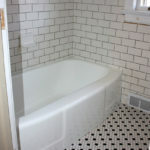 I love the white subway tile! Loving the subway tile! Great fabric choices. I especially love the top 2. Look forward to more pictures. Love the look of subway tile. 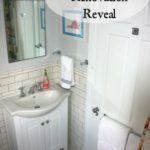 Your bathroom is going to very pretty…can’t wait to see what you decide on for fabric!